For over thirty years, 3C-C.L.O.M.E.A. has been involved in the production and marketing of a vast range of bending machines, machine tools and equipment for metal sections. 3C-C.L.O.M.E.A. is constantly seeking out new technologies and innovative solutions to improve the quality of its products and to be able to offer the best solutions for the customers needs. With many years of experience, constant market research, evolutionary planning, and great care in performance and customer assistance, 3C-C.L.O.M.E.A. has grown to become a leader in the in the roll bending industry. 3C-C.L.O.M.E.A. 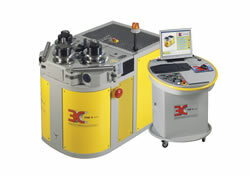 designs and produces low, medium, and high power Bending Machines with both manual and computerized numerical controls. This allows you to control the bending in automatic multi-run or in single run mode. This feature is useful when dealing with complex geometric shapes and ensures fast performance and safe repetition. The great versatility of 3C-C.L.O.M.E.A. bending machines ensures that these can be used in various industries such as the tube industry, automotive industry, light and heavy ironwork, door, window, and storefront frames, and ship building.